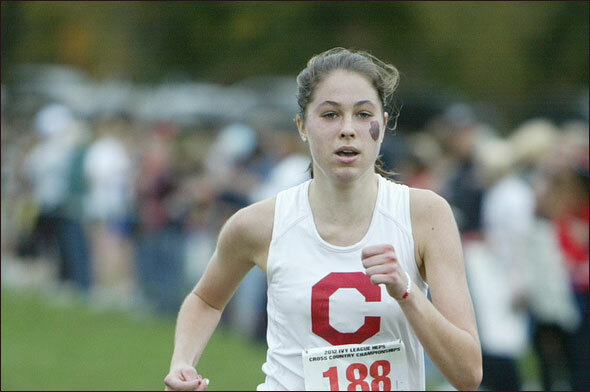 After so many times of coming close to a title, Cornell’s Caroline Kellner is finally a Heps champion. In the women’s 10km, Kellner and Princeton’s Kathryn Fluehr broke away from the pack, giving themselves a 200m lead by the time they had 9 laps to go in the competition. Kellner and Fluehr stayed together until Kellner broke away from Fluehr with 3 laps to go. Fluehr could not respond and Kellner went on to win the title in 34:28.08, making her older sister and former Heps champion in the same event, Katie, cry in the process. The women’s discus was the final scoring event for Day 1. Harvard’s Nikki Okwelogu defended her title with a new championship record – 180-08 – winning by almost 36 feet over Cornell’s Camryn Goodman (146-04). Cornell claimed both 10km titles to close out Day 1. Ben Rainero now has an Outdoor Heps title to his name as he won the 10km in 29:41.73. Princeton’s Michael Sublette used his kick to pass many in the field on the final lap to secure second place in 29:43.14, edging out Yale’s Kevin Dooney (29:43.38) and Dartmouth’s Daniel Salas (29:43.54). Rainero’s win helped Cornell propel into first place in the team standings after 5 events over Princeton. So how do we look going into Day 2? In terms of number of qualifiers, Cornell men and Dartmouth women have the most in their respective competitions. Cornell has 17 qualifiers, qualifying at least 1 athlete in each track final except for the 800m. Princeton men are the only other team with more than 10 as they have 14. Columbia has the third most number of qualifiers with 7, while Brown and Dartmouth both have 5; Penn with 4; and Harvard and Yale both have 3. The number of women qualifiers is more evenly distributed. Dartmouth leads with 10, followed by Cornell and Harvard with 9; Columbia and Princeton with 8; Penn and Yale with 5; and then Brown with 4. Now, we attempted to rescore the meets based on the track finalists, the results from today’s field finals, and keeping the pre-Heps placements for the remaining field-relays-multi finals. Cornell still has a good cushion over Princeton in the men’s competition – 54 points compared to 61 points in the entry projected scoring. Dartmouth was the most impacted by today’s races as they lost 15 points compared to the scores we shared yesterday, making it a tight battle with them, Brown, and Yale for mid-pack results. The Harvard women’s 95 point cushion has shrunk to 54 points over host Princeton, while Brown has gained 21 points based on today’s results. Action resumes tomorrow at 10am. This entry was posted on Saturday, May 7th, 2016 at 4:56 pm. It is filed under Heps Champs, Spotlight. You can follow any responses to this entry through the RSS 2.0 feed.